A trio of styled living spaces gives this open-concept lake home a calming, comfortable character. One-of-a-kind rugs provide distinctiveness and depth to each area in the home, while sling leather lounge chairs add versatility to the main living space without sacrificing style. Together with colors and accents reflecting nature itself, this first floor renovation builds an atmosphere fit for relaxing or entertaining. 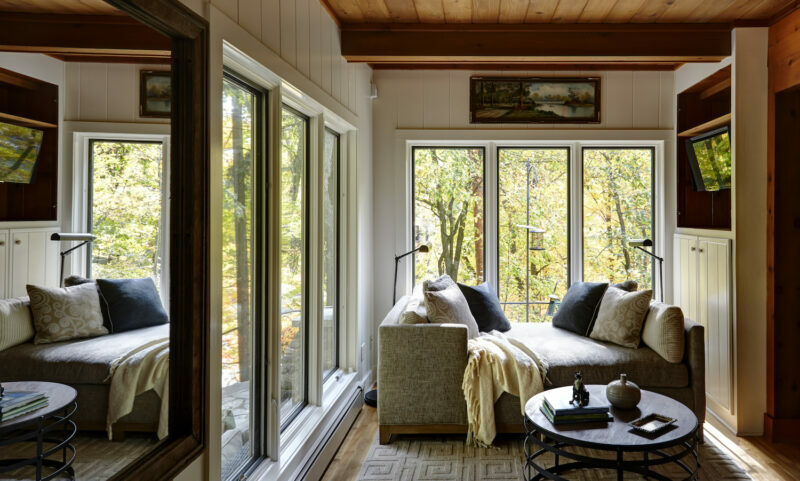 After moving to Crystal Lake to fulfill her dream of owning a lake house, this homeowner sought to transform this dim lakeside cabin into an airy and refreshing retreat. Newly painted pine walls allow natural light to linger in the space, while potted plants and a handcrafted wood buffet reflect the owner’s love of gardening. Vintage baskets, mementos and accessories further an emotional connection and create a cozy, welcoming environment for family and friends.